It's been nearly three months since the Vancouver Canucks and Calgary Flames last faced each other, but the Northwest Division rivals will be meeting more frequently as the regular season winds down. Vancouver and Calgary, both looking to gain ground in the division, will play the first of three remaining matchups in 2007-08 on Tuesday at Pengrowth Saddledome. The Canucks (38-27-10) have won six of their last nine games, but were unable to secure their fourth straight victory overall on Friday, falling 2-1 to Northwest-leading Minnesota. Sami Salo scored a power-play goal, while Roberto Luongo made 19 saves for Vancouver, which was whistled for six penalties for a second straight game. "I think that was the single biggest reason we didn't get much flow early on in the game," Brendan Morrison told the Canucks' official Web site. "We took too many trips to box, there were a couple of questionable calls but you've got to live with them and move on." Vancouver won't have too much time to dwell on the defeat as it has seven games left to reach the playoffs for the sixth time in seven seasons. The Canucks are tied with Colorado for seventh in the Western Conference. The defending division champions also are currently third in the Northwest - two points behind Calgary (39-26-10). The Canucks and the Flames face each other again Sunday before closing out their respective seasons on April 5 in Vancouver. Vancouver holds a 4-1-0 edge over the Flames despite a 2-1 loss at Calgary on Dec. 31 in the teams' most recent meeting. Luongo has started all five games against the Flames, posting a 2.18 goals-against average. 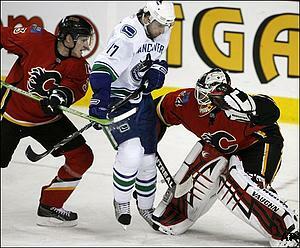 Calgary's Miikka Kiprusoff hasn't performed nearly as well, going 1-3-1 with a 3.51 GAA versus the Canucks. Kiprusoff, who is 3-2-0 with a 2.47 GAA in his last five overall starts, stopped 22 of 24 shots before he was replaced by Curtis Joseph in Calgary's 2-0 loss at Colorado on Monday. The Flames, who last won the Northwest in 2005-06, remained one point behind Minnesota, which lost 5-3 at Edmonton on Monday night. "They outhit us and outplayed us," Flames coach Mike Keenan said. "They were certainly desperate and they were more desperate. I expected us to play more desperate because of the opportunity for us to move into first place. We knew that Edmonton was winning by a lopsided margin and the players didn't play harder and more desperate considering the opportunity." Calgary is sixth in the West and has six games remaining to clinch its fourth consecutive playoff berth. The Flames play their next two at home before a season-ending four-game road trip. They have won three straight at Pengrowth Saddledome, their longest streak there since a four-game run from Feb. 17-28, 2007. Kiprusoff, who won an NHL-leading 28 games at home last season, is 6-0-2 with two shutouts and a 1.73 GAA in his last eight starts in Calgary. It is unknown if he or Joseph will start Tuesday. Joseph hasn't faced Vancouver this season, but is 15-22-0 with four ties, a shutout and a 3.37 GAA in 43 all-time meetings. Calgary captain Jarome Iginla leads the team with 48 goals and 91 points - third-most in the NHL - and had eight goals and four assists in seven games before Monday's loss. Iginla has been kept off the scoresheet twice in five meetings this season, but has 21 goals and 49 points in 59 career games against Vancouver.